It was a warm day, the kind of late spring day typical of San Jose, when socialist thugs attacked a Trump Rally. Armed with eggs, bottles, and fists, the marauding supporters of Bernie Sanders came with the full intention of creating chaos. The Police were tipped off, as they were there in force. But, their job was not to interfere as much to ensure no one got killed. The Mayor of that fine city, a Democrat socialist sympathizer, wanted to let the agitators have some fun. The chaos that resulted was more reminiscent of the type of political violence one sees in Europe or South America rather then an American city. 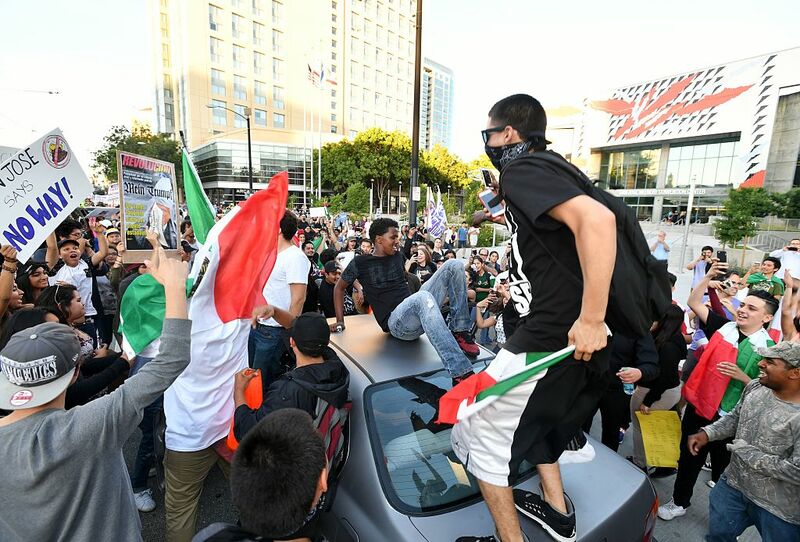 The protestors, many illegals threatened by Trump, burned American flags and waved Mexican ones. Apparently, they were not pacified by Trumps lackadaisical enforcement plan, or don’t trust the king of multi-speak. In any case, the emulators of Italian Black Shirts were out for blood and got it. What is being seen is the breakdown of the civil society. Something not only evidenced by rampaging Sanders’ supporters, but Black Lives Matter riots, college campus’s wars on free speech and a host of other things as well. Eight short years ago, no one could of fathomed state enforced potty perversion, or legal sanctioning of gay’s playing house. Neither could one believe a lying Narcissist, whose command of the English language strains to go beyond 5th grade, could be on the precipice of becoming the Republican Nominee for president. All of these events are interconnected in ways most do not realize. Andrew Sullivan surprisingly nails it in a piece he wrote for for the New Yorker. While Sullivan’s article has more than a bit of his normal liberal dribble, it is nonetheless well thought out. In it he blames Trump’s rise on the over democratization of American politics, the loss of social norms, and the equalization of society among other things. In the piece he even cites Plato and Madison (almost sounding conservative). He fails to tie Bernie Sanders and rising political violence into the mix, but it does not take much imagination to understand it is. The main point he makes is, American society is ripe for dictatorship. Two of sources he quotes from are Sinclair Lewis’s It Can’t Happen Here, and Eric Hoffer’s The True Believer: Thoughts on the Nature of Mass Movements. He notes that in Lewis’s book the main character is the Trump like Buzz Windrip, whose followers also bear an uncanny resemblance to Donald’s adoring fans. Buzz even goes to his party’s convention in Cleveland, where the “vulgar, almost illiterate, .. public liar” easily gains the party nomination. Andrew finds in Hoffer’s treatise on mass psychosis (which helped him earned the Presidential Medal of Freedom from Ronald Reagan) many shared factors between followers of dictators and Trump loyalists. What he doesn’t realize is the same applies to Sanders’ supporters. Despite many fine points, Sullivan never can admit who’s responsible for the present situation. Likely because it is the Progressives who have led the way to decline: financially, socially, and morally. Obama, for instance, has been extremely successful in pushing this trend along. Unfortunately, if any of the main candidates become president, the present trend will continue. Bernie is a socialist who would drive the country even further to the left, and towards insolvency. On the other hand, Trump and Clinton are just different manifestations of the same progressive disease. All them will take advantage of the coming economic downturn to grab more power for themselves. Sullivan surmises that “In terms of our liberal democracy and constitutional order, Trump is an extinction-level event.” Quite possibly true, but so is Hillary. While Clinton is not as hyperbolic, openly narcissistic, and classless as Trump, she would build on Obama’s legacy of liberal lunacy and centralization of power. The main difference is, with Trump or Sanders, you get crazed minions willing to suspend logic and reason to boot. Truth be told, the major parties this election season are offering up a buffet of dung. The menu includes an unindicted felon, a Mussolini want-a-be, and a Che Guevara apologist. People who are a sign of the times, and a reflection of what progressive led liberalization has done to America. A once proud conservative nation, now being driven by a populous of virtueless malcontents into oblivion. People who can’t seem to understand that self-absorption and constant lying are disqualifiers for public office, or that socialism is another word for crushing of the human spirit. In the end, Sullivan gets it half right. In terms of our liberal democracy and constitutional order, progressive and liberal ideology is the extinction-level event. Trump, Sanders and Clinton are merely symptoms of a long running and fatal disease. The only cure that can turn things around is to go back to what created the Greatest Nation on Earth in the first place; the Constitution, basic values, and wisdom of America’s founders. Unfortunately, Cruz is no longer in the race.